It's no secret that we're all here because of gaming. We love video games. We love talking about video games. And we love writing about video games. But what about those other games we play? The non-video games? As I was sitting around a table playing Setback on Tuesday night, it stuck me how much fun I was having playing a non-video game. Setback is a 2-team card game based around a point system. The variation that my husband's family plays is very different to the game as it started, but I'll try to explain the way we play a bit. 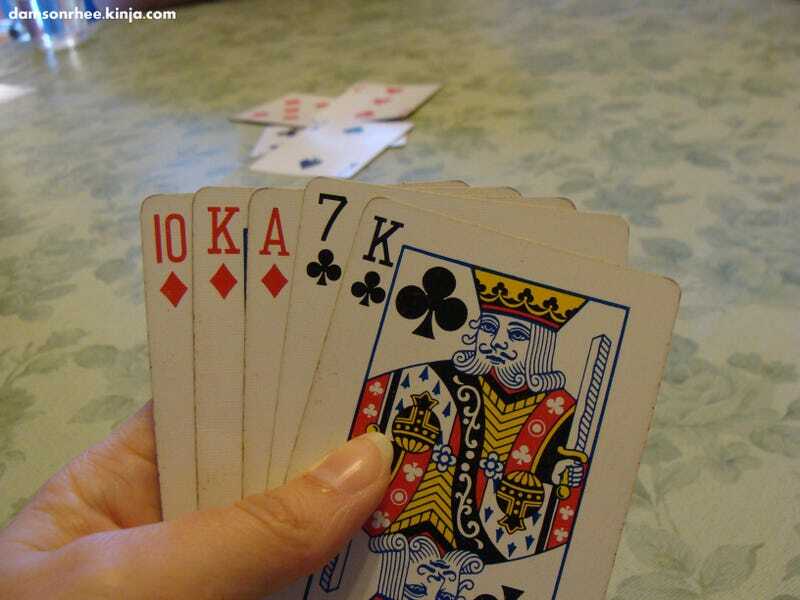 There are 7 points to each hand and when your team gets 21, you win. Six of the points are trump cards: the Ace, the deuce, the Jack, and off-Jack (the Jack of the same color as trump, but not trump), and both Jokers. You also get a point for the cards you win in each hand, but that's making things really complicated. Let's go back to the idea of trump. Trump is what the winning bid makes it. It can be any suit. But wait...bidding?! Bidding is where the idea of setting someone back comes in. At the beginning of every hand, the cards are dealt. While you look at your cards, you try and guess how many of the 6 basic points you are going to get. Say you are looking at my incomplete hand in the first picture. I have the A, K, and 10 of diamonds. Ace is the highest card and gets to take what everyone else lays down (kinda like Spades). I automatically make one point there. And then the guessing comes in. I can take the next "trick" with my King, but how many points will it take? After guessing, you bid. And you can bid up to 7, which is the highest number of points per hand. Highest bid makes trump. Highest bid can also lose points if they don't make their bid. Which is where the name Setback comes in. I've personally gone set on a 2-bid. I've seen people make 7 points on a 2-bid. It's why I love the game so much. There is nothing more satisfying than setting my husband or brother-in-law who have been playing their whole lives. I know this all sounds complicated, but it's not if you sit down and play a few times. Just sitting here, I can hear my grandmother-in-law laughing when she gets a point. Or my daughter asking questions, since she is still learning. I can hear my husband and his brother and father trying to outbid each other. Or my grandfather-in-law asking what trump is...for the hundredth time. It's all these memories that make the game so much fun. Well, that and setting someone. So what about you? Any non-video game you have fond memories of? Or something you play every time friends or family get together? And when you're done telling me about it, go to TAYClassic and tell them about something. Post. Comment. Interact.